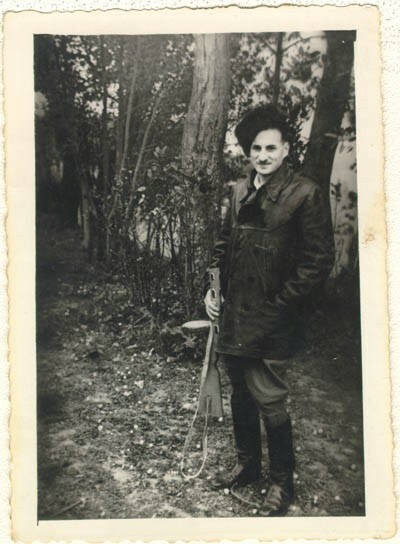 Aron Derman while he was with Polish partisans in 1944. Aron Derman while he was with Polish partisans in 1944. In this photograph, Aron wears a fur hat that he made and boots that he finished himself (he found them in the ghetto, unfinished, and sewed them up). Lisa Nussbaum was also a member of the partisans. Aron recounted that for a short while, Lisa was in charge of 200 women. Photograph taken in 1944, in a partisan base in the Naroch forest.